Analysts can't agree on outlook for semiconductors - what's an investor to do? So, what else is new? Let's look at the two opposing viewpoints. Starting with the positive viewpoint, iSuppli is looking at the second half of the year as being a very positive time for the semiconductor industry. "iSuppli now predicts global semiconductor revenue in 2010 will rise by 35.1 percent to reach $310.3 billion, up from $229.6 billion in 2009. iSuppli’s previous forecast, issued on May 6, predicted growth of 30.9 percent this year. With an $80.7 billion increase, 2010 will bring the largest annual expansion in semiconductor revenue in history in dollar terms. In comparison, semiconductor revenue increased by slightly less than $60 billion during the next best year for dollar chip growth: the dot-com-fueled year of 2000." iSuppli points to several factors for the boom in chips: rising prices, inventory buildups and richer chip content in key electronic products like smart phones and advanced LCD-TVs. If things are going so well, they can only go down from here, right? "Robust semiconductor revenue growth in 2010 is based on a strong increase in the sales of electronic equipment. Factory OEM revenue for electronic equipment is projected to grow by $131 billion to reach $1.54 trillion in 2010, up 9.3 percent from 2009. The previous high for electronics OEM revenue was $1.53 trillion in 2008. Shipment and revenue growth for electronics equipment is surpassing expectations in areas including PCs, cell phones, LCD-TVs and other semiconductor-rich products." I'm not sure where iSuppli gets the projected revenue numbers referenced in the preceding paragraphs but it is clear they are pretty optimistic numbers. Unfortunately, recent Durable Goods reports don't do much to generate confidence in an outlook quite this bullish. iSuppli makes the point that semiconductor revenues are in a special situation. Pricing strength is unusual because both inventories and capacity were so drastically reduced in 2008 and early 2009 and now that demand has improved, shortages are driving high prices and juicing revenues. Another factor is that there is a trend to more sophisticated system-on-a-chip solutions that are harder to design and manufacture, command higher prices and yield fatter margins. The fact these chips are also seeing somewhat of a shortage also serves to increase semiconductor revenues. Another optimist, Bill Jewell from consulting firm Semiconductor Intelligence LLC, said he believes capacity utilization will continue to increase through the rest of the year, hitting 96 percent in the fourth quarter. Jewell said he believes end demand will hold up at least through the end of this year. "I think capacity got cut so far back last year and just has such a long way to come back." The chart also illustrates iSuppli's thesis that semiconductor revenues will return to normal seasonal patterns beginning in 2011. "Semiconductor industry capacity utilization will peak during the third quarter at 96 percent, then decline to 90 percent in the fourth quarter,"
A decline in capacity utilization is a sign of slowing sales; hence, the importance this measure is accorded. Danely also said the PC end market, which accounts for 40 percent of semiconductor sales, appears weak. Perhaps he has newer information than the most recent Durable Goods report which shows new orders still in an uptrend. Indeed, Danely says Taiwan supply chain checks show that order rates from the PC end market deteriorated sharply during the last part of July. The communications end market, which accounts for 25 percent of chip sales, he believes is also showing signs of weakness. This is confirmed by the drop-off in new orders for the communications sector in the last Durable Goods report and is also illustrated by Cisco Systems Inc.'s second quarter results, which disappointed analysts and contributed to a down day for tech ETFs. In actuality, both optimists and pessimists see semiconductor revenue growth peaking this year and dropping off to more typical rates next year. The difference in outlooks vary by only a quarter or two. Having concentrated on analyst opinions, it is worthwhile to review earnings season and what company management thinks. There are 95 semiconductor companies in my earnings report database. Of these, 68 beat expectations and 92 showed year-over-year revenue increases. There were 62 companies whose management offered forward guidance; of these, 32 provided upside guidance, 25 in-line or mixed. That leaves only 5 companies that offered downside guidance. All in all, the sector has turned in pretty results this earnings season. 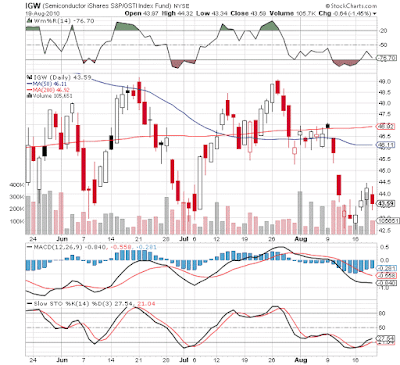 With IGW, the iShares Semiconductor ETF at a three month low and the rest of the year still looking fairly strong for the sector, an aggressive play would be to buy at this point on the expectation that an upside bounce is due. The chart below shows the cyclical nature of the price action over the last three months. 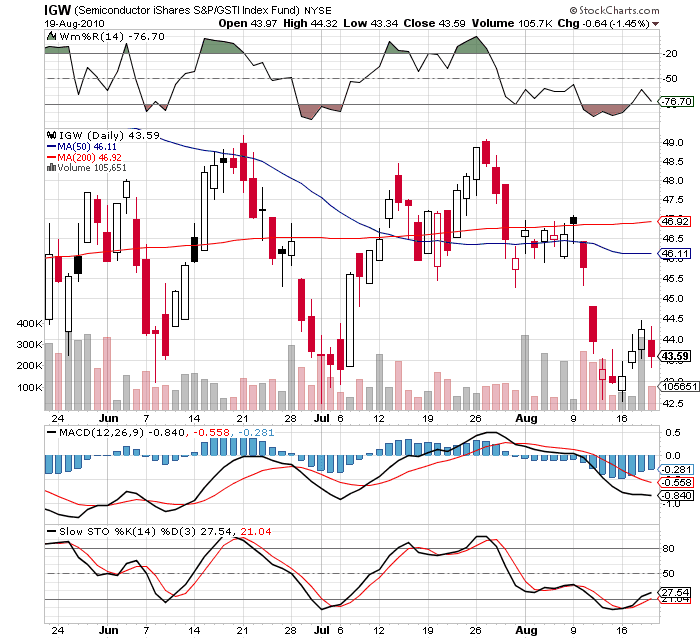 Note that MACD and Williams %R do not confirm the Slow Stochastics buy signal. In addition, the overall stock market is currently struggling and this can be a headwind for any individual sector. In summary, the semiconductor sector does not appear to be over-valued, in terms of capacity utilization it is running essentially flat out and revenue growth will slow from an unusually strong rate to a more normal rate over the course of the next couple of quarters. Is it too late to invest? Yes, it's too late to take advantage of the big surge in growth rates that occurred during the last year. But the current pessimism of investors could be an opportunity to buy into a hot growth sector at reasonable prices. Keep in mind that bringing on new capacity in the semiconductor industry is not trivial or quick; therefore, high capacity utilization should continue to support prices and revenues, especially for those more complicated or smaller geometry chips where capacity is most constrained. The consensus seems to be that growth rates may slow but no double-dip will occur in the semiconductor sector. That's actually a better scenario than most investors seem to expect. Don't write off the semis yet. Consumer electronics sales, including PCs, always slowdown mid summer so detecting this via Asian sales data is not a good input for the longer term trend which is up due to PC replacement driven by Windows 7. Many PC users skipped the Vista models due to problems with it and so the Win 7 cycle is much stronger than normal and will run for multiple years. Also, the fear off chip oversupply is inconsistant with Cisco's comments in its quarter that it can't get enough chips which may even hurt its own shipments due to the shortages. These shortages persist due to insuffient plant investments by semi companies over recent years. I followed semis for 27 years on the street and this is the best outlook I've seen since the 90's. Is company guidance worth listening to? Does finding winning stocks have to be so hard?